Despite all attempts to be innovative, this Triennial – which can be seen from 9.5 to 30.10.2016 in the Central Museum of Textiles in Lodz – displays a comparitively traditional image of the textile art scene. 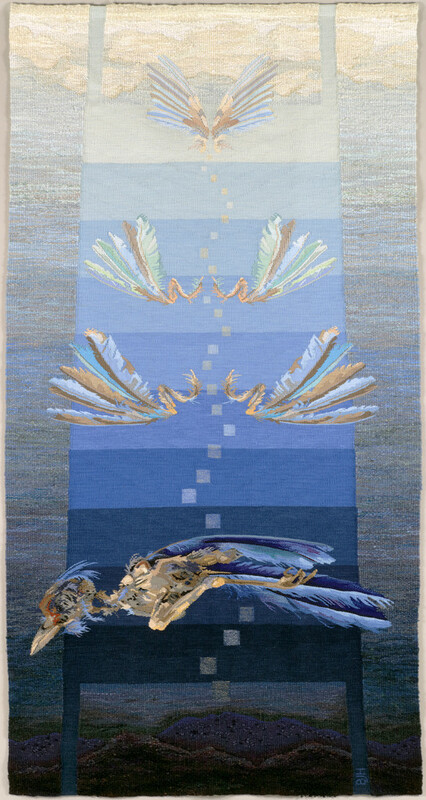 Whether traditional or modern, 39 of the 135 works are woven, 15 use tapestry technique and 5 use digital Jacquard technique. 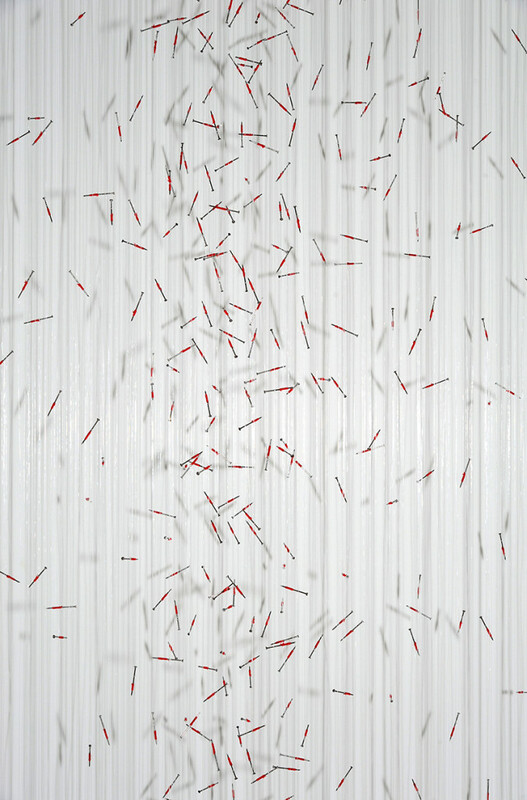 Around one third of the works are three-dimensional installations, the rest are largely designed for the wall. 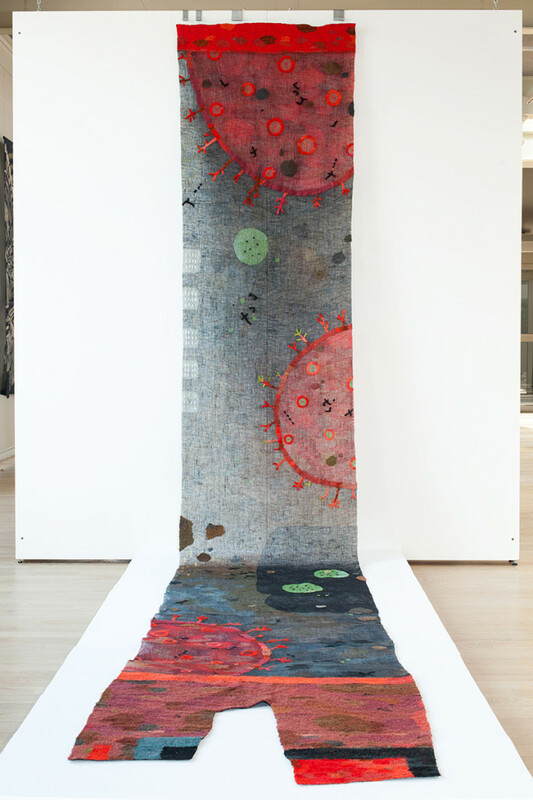 The 15 artists who use the technique of embroidery were in the majority, followed by sewn assemblages/patchwork (13 works represented), paper and felt (10 works) printing and dyeing techniques (7 works), of which 2 use digital printing. 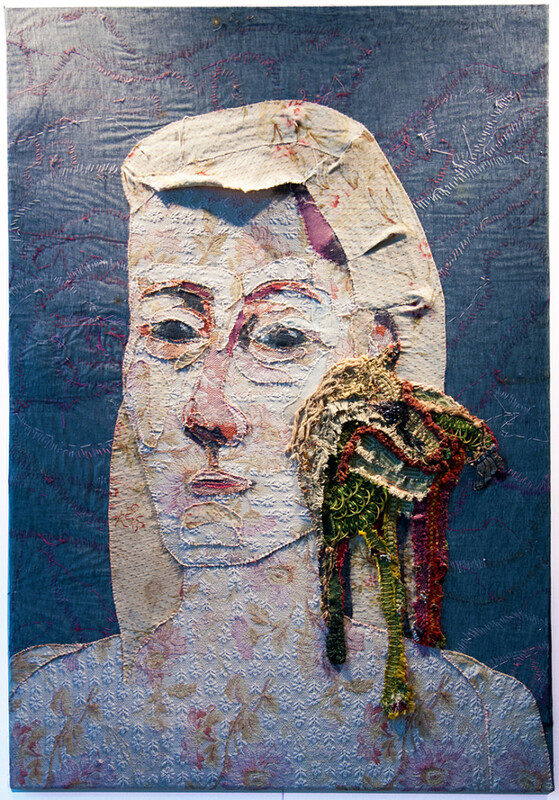 The great feature of this Triennial is that mainly real textile artists are shown here (the works are created by the artists themselves in contrast to painters who only deliver their designs to have them woven by Flanders Tapestries). What remains missing is the possibility for a larger participation by young artists, which could be achieved by asking the national consultants to look at the age of the artists they are recommending. The still small Triennial for Young Textile Art was received very positively by the visitors, a great promise for the future. The Triennial offered a full range of high quality but also work of less convincing quality. 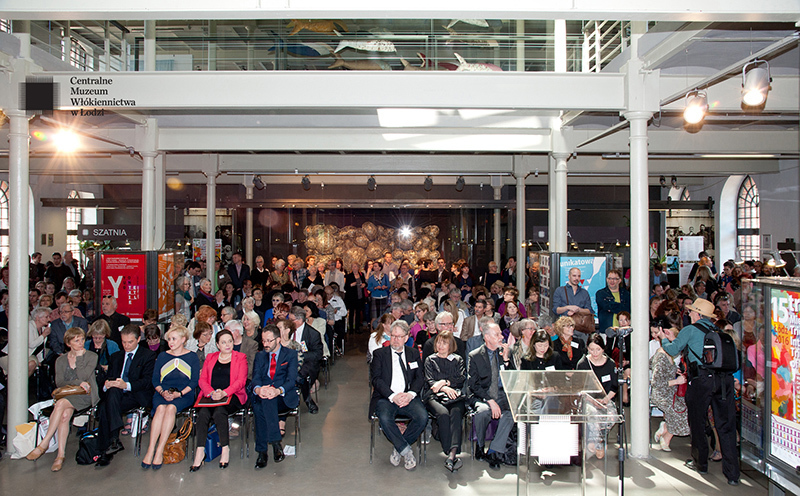 Altogether this Triennial made for a very lively impression. Several visitors stated that this time the exhibition was more interesting than three years ago. The hanging of the art in the beautiful rooms of the museum emphasised the contrasts and looked just wonderful. One can only praise the organisers of this exhibition! 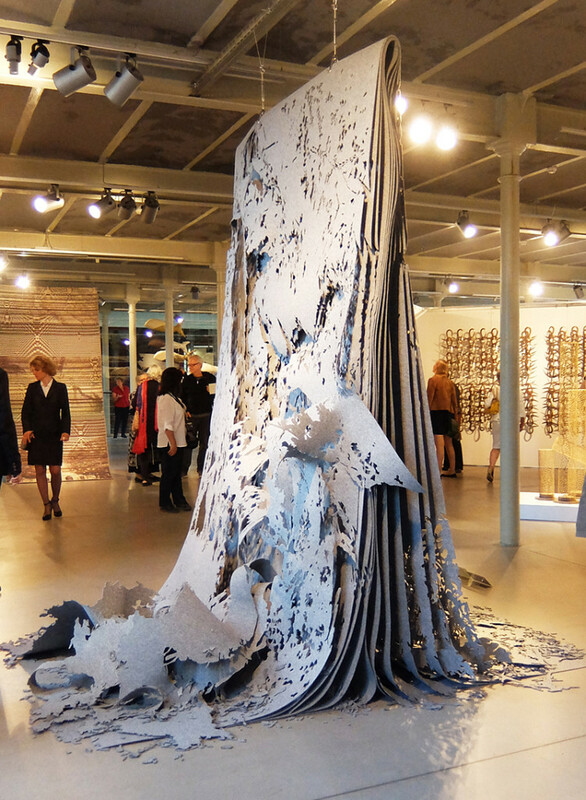 The opening festivities of the Triennial showed that there still is a great interest in textile art among the Polish public. The visitors had arrived from across the country and, in addition, a large group of foreigners who came from all five continents of the world. As usual at this event, the audience was presented with a textile art marathon of various openings running over three days. 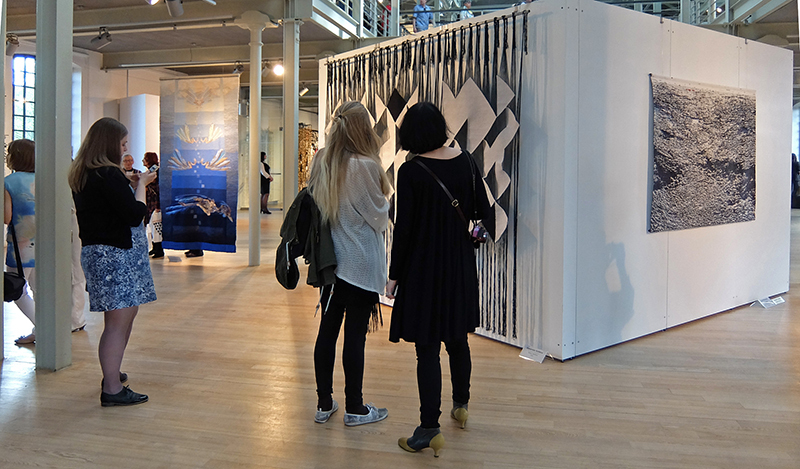 As noted earlier, most visitors liked – after the Triennial itself – the International Young Textile Art Triennial. Further the solo exhibition of Wlodzimierz Cygan, professor of textile art of the Strzeminski Academy of Fine Arts in Lodz was praised by many. Those visitors who had seen previous editions of this event, perceived this year´s Triennial as a very vital and interesting one. 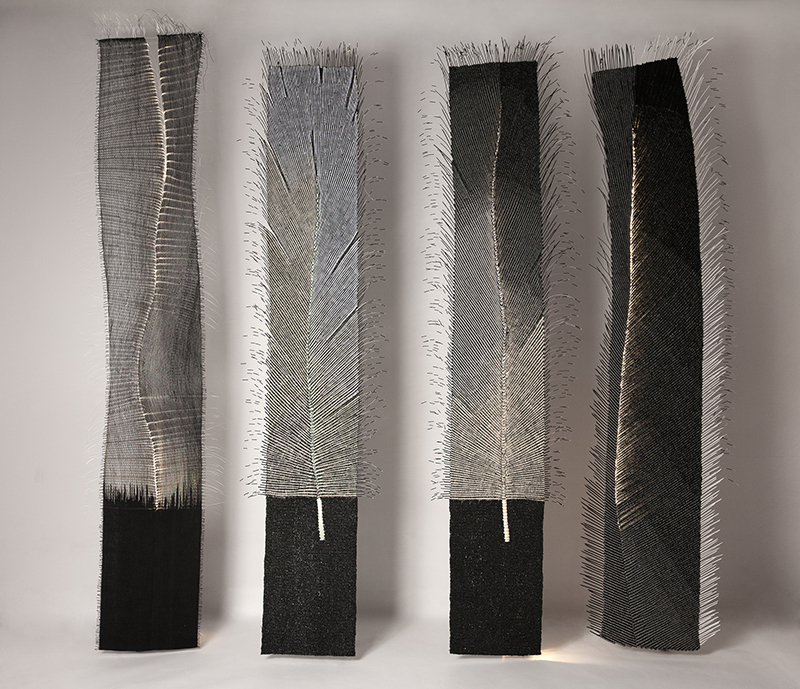 It seems that the new interest in textiles within the „fine art“ scene, has now had a positive impact on those making textile art (this refers to all artists who make their art themselves using textile materials or textile techniques). This exciting development was also reflected in the work of the young artists, who – with youthful nonchalance and not stuck in tradition – go new routes where the textile aspect only occurs every now and then as an idea or impression. 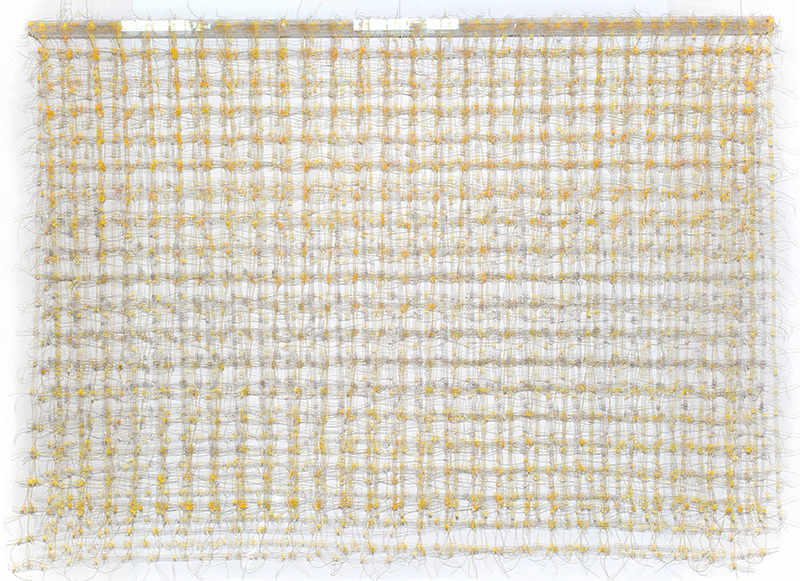 Are the current „Art exhibitions with textile“now coming closer to the „Textile art exhibitions with works of art in a craft medium? Until now these two categories remained separated! It would somehow be a pity if work dealing with textiles would only be for fun or arbitrary. It is precisely this Triennial that shows how wonderful the art work can be when the artists know how to deal with textile materials and technique and can express their theme subtly. However, it would also be wonderful if the artificial separation between different types of art are eliminated. Even within textile art there are such divisions. Unfortunately, the artists working with patchwork/quilting, felting, embroidery or weaving each have their own “ghetto” and regularly do not see what is happening beyond their chosen technique. This Triennial displayed this kind of separation of walls already broken down but, perhaps, eventually the Triennial of Young Textile Art could help overcome the other hurdles. 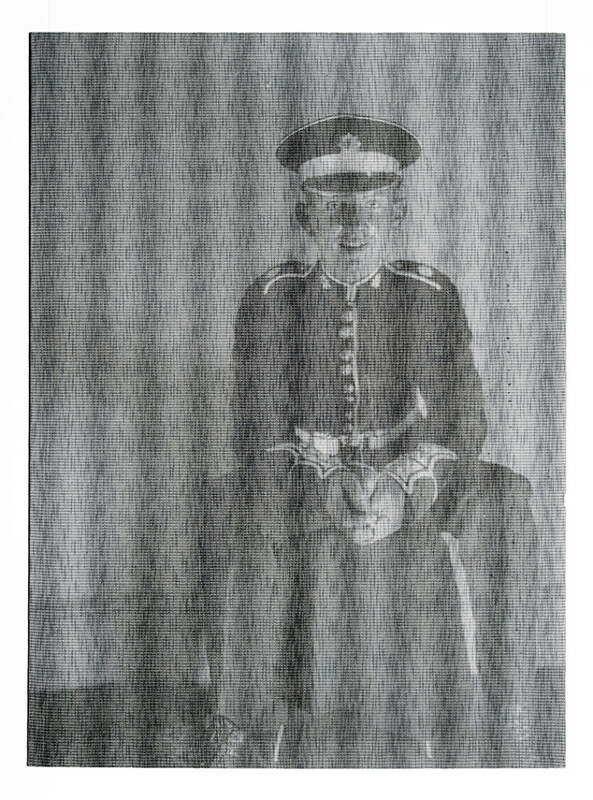 The choice of artists had been made with the aid of the national consultants and through the organising committee (a method to be examined and possibly be reformed). The awards, however, were chosen by an international jury consisting of Małgorzata Markiewicz Wróblewska / PL, Thomas Cronenberg / D, Yoko Ikeda / Japan, Bruce Pepich / USA, Magdalena Soboń / PL and been Renata Rozsívalová / CZ made. The gold medal (and the prize donated by the Akapi Foundation to Triennial’s newcomer!) went this time to Tereza Barabash / Ukraine for her work “Rain in Ukraine”. Because the jury knew neither the title of the work nor the name or country of origin of the artists, this prize was not politically motivated. 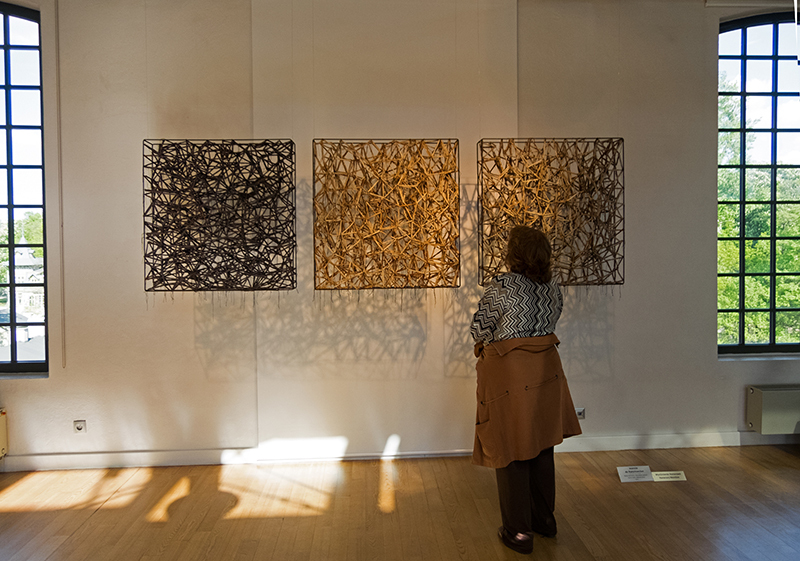 The very finely crafted installation was compiosed almost entirely of metallic threads, a further point of debate among the visitors. 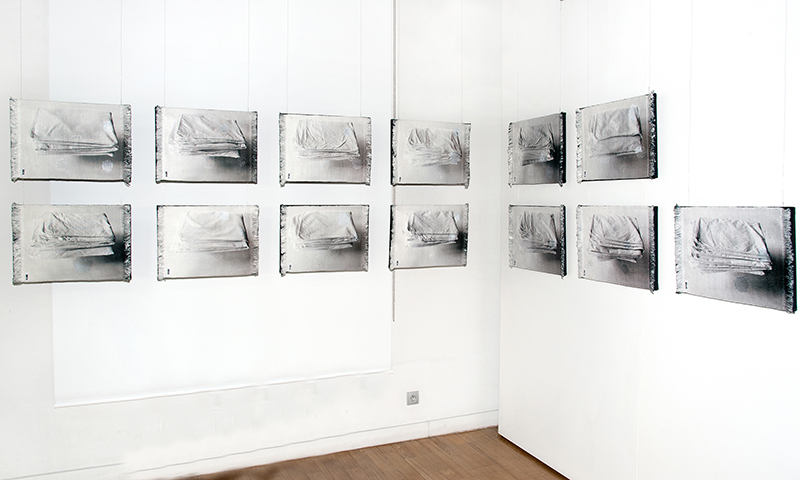 The silver medals were Anne Bjørn / DK for “Transparent Landscape” and Laima Ore-Or˛ekauskienė / LT for “Dedicated to Father”. Three bronze medals were awarded to Peter Horn / D for “Who did this?” Joanna Rusin / PL for “Compositionon Canvas” and Anna van Stuijvenberg / NL for “Do you see it, it doesn t see you”. 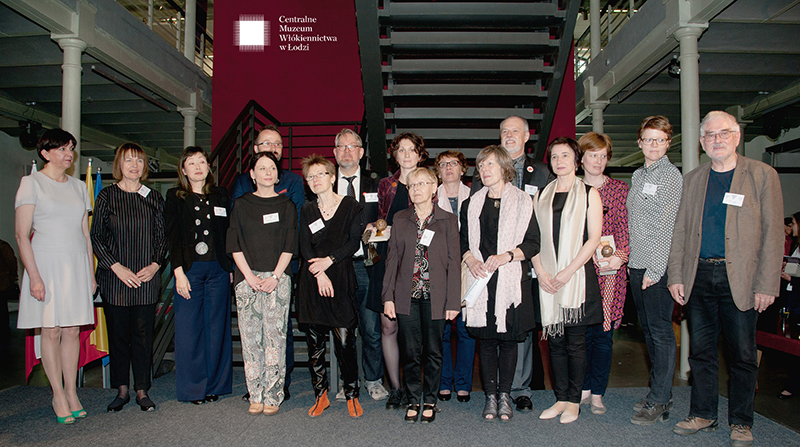 A further five awards went to Katalin Fóris / H, Toko Hayashi / Japan, Ian Nigel Hurltone / UK, Jeannie de Raeymaeker / B and Anna Kowalska Więckowska / PL. 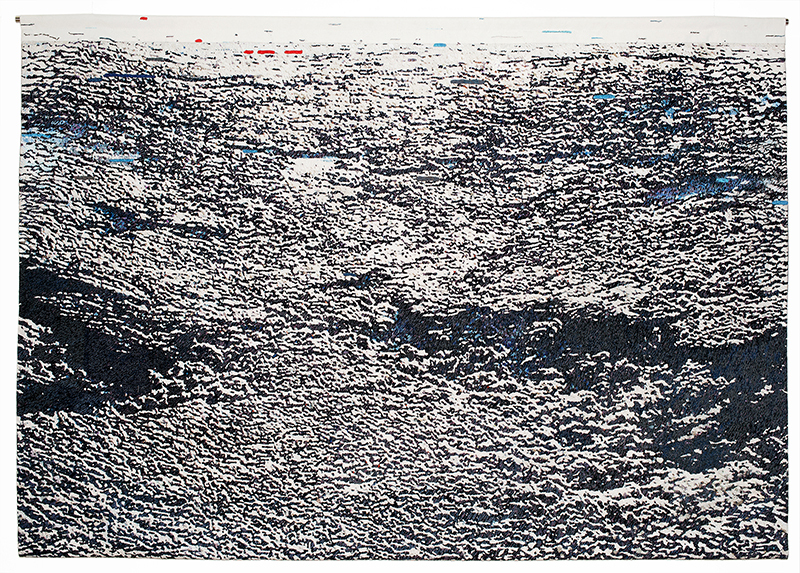 Further, Tohru Ohtaka / Japan received the prize of the Central Museum of Textiles in Lodz for “My City of Water”, 295 x 154 cm, 2015. 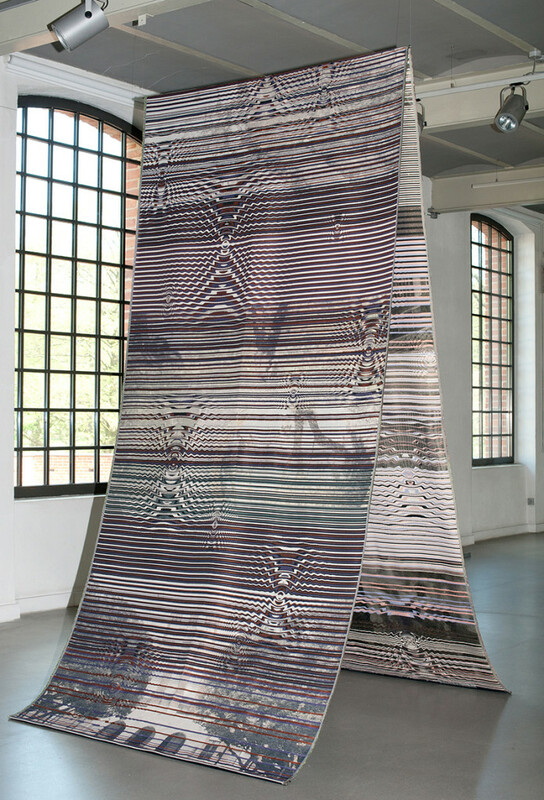 All the other names of the participating artists and the accompanying events may be found on the museum’s website: http://www.muzeumwlokiennictwa.pl/1-triennale/1/547,15th-international-triennial-of-tapestry-lodz-2016.html. An extensive catalog is published and available at the Museum. For the finisage (Oct 2016) a book on the Tapestry Triennale of Lodz will be released. 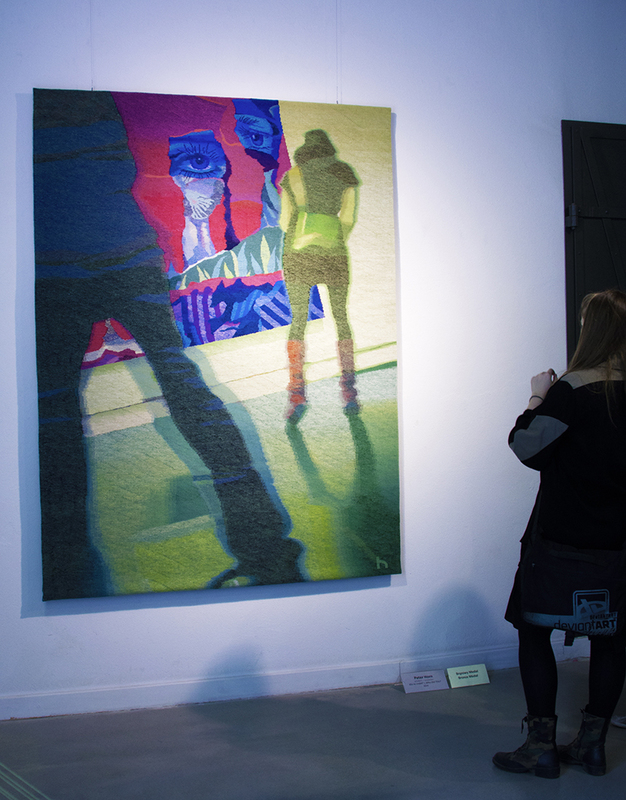 Category: Exhibitions Tag: "15th International Triennial of Tapestry, "textile art", °Tapestry Triennale of Lodz", Łódź 2016"